Martine is a pre-teen girl, now an orphan, living with her grandmother in South Africa after a horrible death of her parents. She has two best friends – Jemmy, a white giraffe with whom she shares a beautiful history, and Ben, a boy of the same age at her school, friendship with whom is destined to grow tighter after events as told by Lauren St. John. Martine has to deal with many issues, sometimes too many for a child. Trauma of loss, new environment, peer pressure, all come together and serve as a vehicle for the development of her character in the book. Martine has also to come to terms with her newly discovered healing power. In the animal kingdom, she finds herself at home and at peace. She uses her gift to help. She rescues a dolphin. And then, an impossible challenge follows. Martine’s school trip doesn’t go as planned. A terrible tragedy strikes their ship in the middle of the ocean. Martine and her classmates, also Ben, find themselves on an uninhabited island where dolphins come into picture again. Not only she faces an ultimate survival test, but also finds that her help is badly needed one more time. A fantastic read for teenagers, the book teaches the value of discipline, good character and true friendship. Lauren St. John writes from her knowledge and life experience of the region which she uses as a setting for her book. 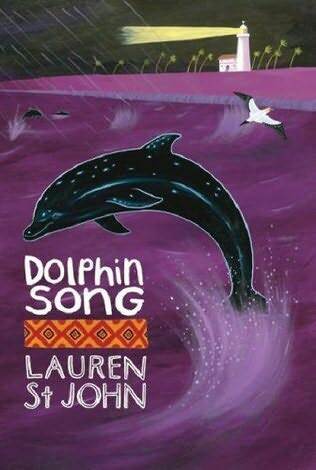 Dolphin Song is the second book in the trilogy. The other two are The White Giraffe and The Last Leopard.